When I was little, I remember playing make-believe games with my friends and often pretending to be in school, with me as the teacher. I know! Hard to believe, right? All sarcasm aside, it was later on, when I was about 12, that I knew I would absolutely love being a French teacher. But that wasn't my only choice. In high school, after studying biology my first year, I contemplated becoming a molecular biologist. It was also in high school that I first began studying Italian and Spanish, and playing with the idea that I could become a translator. I also took a course in accounting and enjoyed that, too, so yes. I considered it a possible career choice as well. Once in university, I took on three part-time jobs simultaneously - a cashier at Home Depot, an accounting assistant at the student union and a teacher's assistant for a first year Spanish course. In my final year, I applied to Teacher's College but, for fear of not being accepted into the program due to lack of volunteer experience, I attended a job fair and contemplated joining the Naval Reserves as a naval communicator. Pretty crazy, isn't it? Or is it? Looking back, I had a genuine interest in and inclination towards each and every one of those job areas. It only made sense to keep my options open since I am a multi-faceted individual with many talents to offer. And that is the message I want to send to my kids. I look at them and see their potential to learn and grow into successful and hardworking adults that may eventually choose not one but multiple career paths throughout the course of their lives. And that's okay. Let their imaginations soar, I say! This is why I'm joining in the Barbie "You Can Be Anything" campaign. With over 155 Barbie careers to choose from, children can engage in imaginative play that will inspire dreams and spark creativity. From Mermaid to Movie Star, Pet Vet to Police Officer, Fashionista to Fairy Princess, you can be anything. Barbie is ready to make bold business moves and strike out on her own to achieve her career dreams. 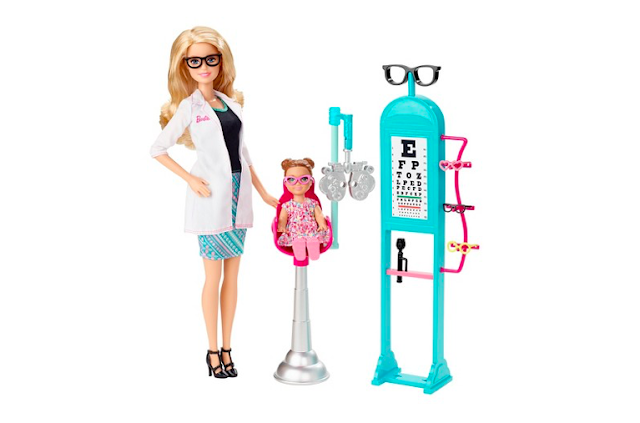 Your little ones might not yet know what a CEO is, but with Barbie they’re learning that it’s an obtainable goal. By encouraging your little ones to make believe with lots of different career options, you’re showing them that the world really is their oyster. From public relations to investment management, there’s no limit to their options! Lights, camera, action! There is so much that happens behind the scenes of your little ones favourite movies. From costume and set designers, to camera and sound technicians, and even the director, there’s a whole world for your little one to explore! If they’re particularly interested in how their favourite movies or TV shows are made, explore all the different roles and people that are required behind the scenes. Explain how they all come together to form a team and create an amazing end product! From their pediatrician to their ophthalmologist, your little one probably knows some of the different kinds of doctors. But, have your ever chatted with them about all the different medical specializations that there are? From podiatrists to pediatricians, try discussing some of the different kinds of doctors and health care professionals with your little ones. You’ll open their eyes to an entire world they might not know about. Win a Barbie You Can Be Anything Prize Pack! The giveaway is open to all of Canada, excluding Quebec. Simply complete the Rafflecopter form below for your chance to win. Please note: If you plan on tweeting as an entry, I encourage you to craft your own tweet by invoking your inner child and sharing what you would like to be when you grow up. Or ask your children, grandchildren, nieces, nephews, or any child you know. I look forward to reading what they aspire to be! Disclosure: I am participating in the #YouCanBeAnything campaign and have received special perks. Any opinions expressed in this post are my own. I wanted to be a interpreter to the deaf when I was younger. I even took two sign language courses when I got out high school, but couldn't go on because next course was on Saturdays and I had to work. I wanted to be a police woman. Dream career would be a full time tourist. Ooo, I love your dream career! And being a stay-at-home mom is a job that is out of this world. So you're more like a super astronaut with the healing powers of motherly love. How's that? I wanted to be a Pastry Chef. I'm not but I am a really good baker. I wanted to be a vet and its still my dream career. I wanted to be a nurse when I was little. I wanted to be a teacher... not quite what happened, but still teach and help others daily. I really wanted to be a teacher but that did not happen. I wanted to be a nurse but found out I really did not have the stomach for it. :) I love the way you think! I wanted to be an airline stewardess. The thought of travelling the world, learning new langauges, etc. But back in the 70s, there was a minimum height of 5'6". I was 5'2". Alas--my dream was dashed. My dream was to go into Nursing, but it just wasn't in the cards for me. I wanted to be a teacher,.. but now, I think I'd make a better criminal profiler. As a child I didn't really know what I wanted to be. I would pretend with the barbies to be in a circus! When I was a child I dreamed of being a Teacher. I wanted to be a driver. I wanted to be a princess or a star. Needless to say, I achieved neither but my hubby does treat me like both, so it's a win in the end :). When I was a girl, I wanted to be a teacher or a nurse. Now I think my dream career would be psychologist. I always wanted to be a hairdresser, and have lots of kids. I wanted to be a movie star. I wanted and still want to be a librarian. I wanted to be a clothing designer but now my dream job is working with seniors.